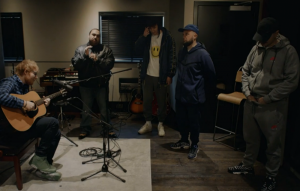 Ed Sheeran has collaborated with Kurupt FM for a new charity single and sketch for Comic Relief. The ‘÷‘ artist has teamed up with the cast of the BBC3 comedy People Just Do Nothing to help raise funds for the charity drive, which will take place this year on March 24. Watch the first part of the sketch below. Elsewhere, it was announced this past weekend that Sheeran will have a guest cameo in the upcoming season of Game of Thrones. The post Watch Ed Sheeran join Kurupt FM for Comic Relief collaboration appeared first on NME.